Meet the city financiers who want to help disabled people start their own businesses. At a breakfast meeting in the City of London, a group of venture capitalists are making a presentation about a fund with a difference. It's called Kaleidoscope and it's aimed at giving financial backing to disabled entrepreneurs. Kaleidoscope's founder, Hardeep Rai, is a veteran venture capitalist who says he wants disabled people to realise that starting your own business is a real possibility. "There are tons of great ideas out there just waiting to be tapped into," he says. Rai's fund will assist in the development of the businesses he invests in and ensure they make a decent return for everyone. It sounds a bit like Dragon's Den for disabled people. I'm hoping that by believing and investing in disabled entrepreneurs we'll be able to make a real difference. Hardeep also has a personal reason for starting the fund. His son Eshan was born with severe brain damage, a fact which has made him think more about the potential of disabled business people. "Over time, as I watched my son develop, I realised the magnitude of his disability and therefore the limitations and barriers he faced to communicating," he says. It made him think that there must be many other people in a similar situation, with the potential - but not the opportunity or backing - to start up their own business. He set up Kaleidoscope after meeting disabled businessman Shane Bratby in late 2014. Shane runs Disabled Entrepreneurs, a website for those who want to start their own business. He believes self-employment can be a great way to earn a living but is aware that coming up with the initial capital can seem for many an insurmountable obstacle. "I think many bank managers are afraid to lend money to disabled people," Shane says. He believes the problem is investors fear they'll never get the money back. The latest figures from the Office for National Statistics (ONS) show that out of a potential workforce of nearly 30 million people in the UK, 12% are disabled. But employment levels for people with disabilities are low. Figures from 2012 show 46% of disabled people in employment, compared to 76% of non-disabled. More ONS figures from the first quarter of this year show that just over four million people in the workforce are self-employed. Out of this group, 14.1% have a disability. Becoming your own boss with your own self-generated income is a tantalising thought for some, but many fear losing the security of regular income from benefits if they try and fail. Brendan (who doesn't want to give his surname for fear of being identified by the Department for Work and Pensions) says he's concerned about being stuck in the so-called "benefits trap". "I'm really frightened that my buffer zone, my safety net, will be gone if I try and go it alone," he says. He wants to start a creative arts business, but has concerns. When he previously started part-time work as a self-employed actor, he says his benefits were stopped. 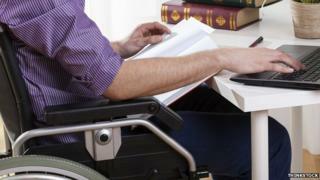 Brendan says the government should be doing more to encourage entrepreneurship among disabled people. He wants to be able to get his business off the ground, but at the moment is too nervous. "What if it doesn't make enough money for me to live on? I need to know that I have enough money to feed myself. It would be great if the DWP realised how big a decision it is for disabled people to start their own business. If they were willing to help more rather than try and take benefits away at every opportunity then more people might do it." The DWP argues that it does offer support through their New Enterprise Allowance scheme, which gives mentoring to would-be disabled entrepreneurs, while allowing them to claim existing benefits such as Jobseeker's Allowance or Employment Support Allowance. It adds that participants may still be eligible for support such as Universal Credit or tax credit once they start claiming the NEA weekly allowance. Brendan is not alone in his worries. In a recent review of literature on disabled entrepreneurs by John Kitching of Kingston University for the OECD, fear of losing the security of regular benefit income was highlighted as a problem. But there's no lack of interest if Kaleidoscope's breakfast presentation is anything to go by. The event is so over-subscribed that another is scheduled for 24 July. "We've had a lot of interest from so many different people," Rai says. "I'm hoping that by believing and investing in disabled entrepreneurs we'll be able to make a real difference." Brad Francis is one of those hoping to tap into the investment fund for his new business idea. Brad had a stroke when he was 29, which left him severely disabled and a permanent wheelchair user. He's had a long career in publishing, which is the inspiration for his business proposal. He tells me that Kaleidoscope will be investing in his business idea but that he has "been sworn to secrecy" about the product. Though reluctant to divulge too much he tells me it will be "media-related in a cheeky, cool way with the emphasis on culture, lifestyle and fun - disabled style." One of the potential investors at the Kaleidoscope presentation is John Stapleton, founder of the New Covent Garden Soup Company and the children's food range Little Dish. Like Rai, he believes there is a wealth of untapped potential amongst people with disabilities. He is keen to help but emphasises that this isn't charitable giving. "I'm not planning to give my money away. I'm still on the lookout for a decent return. If the business is right then I'll be willing to invest."